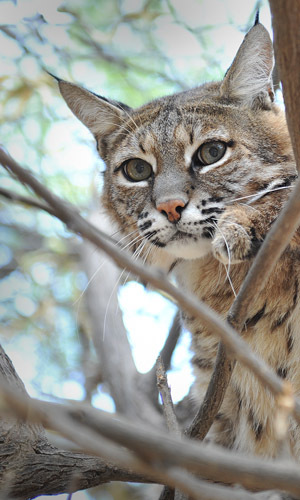 Spock the bobcat was born in 2003. He was found near Casa Grande, Arizona, after being attacked by a dog. He lost part of his left front foot in the fight with the dog and needed surgery to repair the injury. Although he spent a long time in the clinic where we could keep track of how his foot was healing, that didn’t seem to tame Spock much. He’s still a reclusive and shy bobcat. Spock lives in a large bobcat enclosure on the tour route at the Center, but unless he’s hanging out in his favorite tree near the front of the enclosure (and he’s almost invisible in there), you probably won’t see much of him. If you do, you’ll notice that his coloring has more gray than the other bobcats who live with him, and that he walks with a limp. Spock gets along very well with his roommates and can sometimes be seen cuddling with his favorite buddies. He’s quite fond of mouseicles and, in typical cat style, he usually plays with his food before eating it. 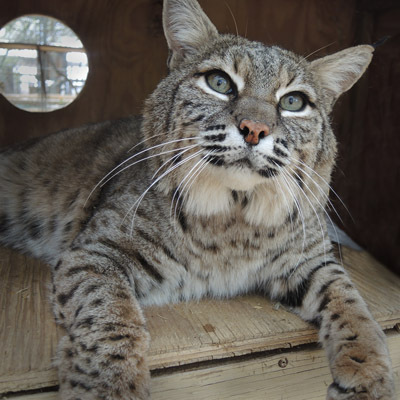 Spock will live the remainder of his life here at Southwest Wildlife.